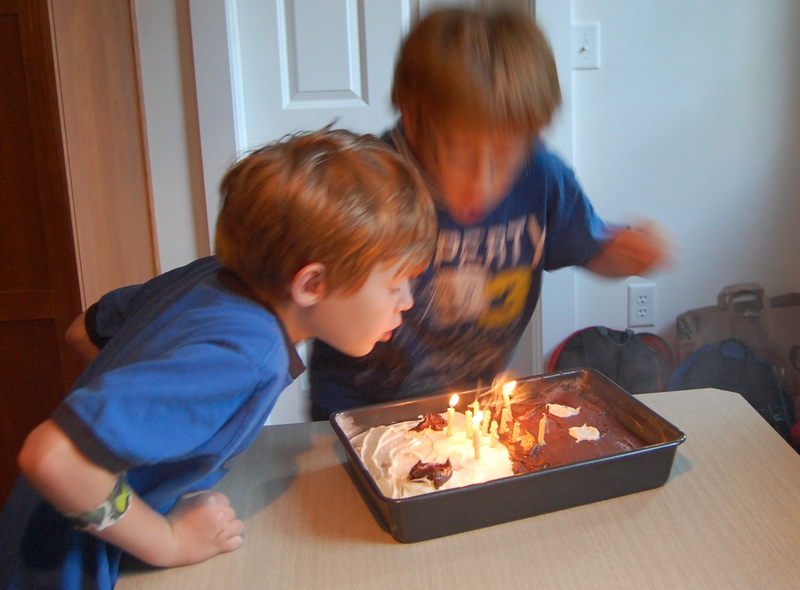 This is Jonah's birthday cake, but Ian had a 1/100th of a second edge on blowing out the candles. OK, explain the frosting? some kind of monster? poop? (I remember you guys like poop jokes). Running out of frosting? time? We like using those candles that re-light themselves. Remind me not to show BJ pictures of any dessert I make. Isn’t it obvious? One kid wanted vanilla icing and the other kid wanted chocolate icing, so we made a domino pattern, but I let Ian make it, so the dots on one side aren’t lined up properly. Also, the dots are the wrong way, but that was my fault. Have I mentioned my cake obsession when I was a teenager? I know how to make icing roses. I haven’t used my talents for my children, though, ’cause they have a cousin who produces (on the spur of the moment), horse, robot, princess, and aquarium cakes, among others. I’m so much happier now that I have an explanation. You mentioned poop and monsters first. Let’s start there as that is more my ground. Say Tuesdays at 9:00. Jeez, all that trouble you went through at the mall, you coulda got em buzz cuts. Thanks. 11-years old. Scary. That’s a pre-haircut photo, but I don’t do buzz cuts anyway. I like a little hair on a boy’s head.